A 5% dividend yield is rare these days, but these three sin stocks offer 5% yields, each of which is supported with underlying free cash flow. Just two or three years ago, investors didn't have to work too hard to find a 5% dividend yield. 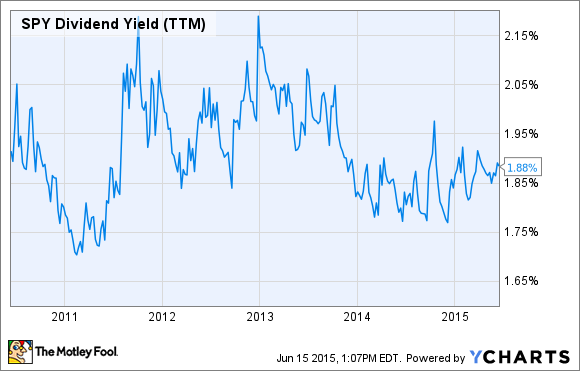 But after a significant stock market rally, high yields are hard to find. As you can see above, the S&P 500 Index doesn't even yield 2% on average now. One good place to look for high dividends is sin stocks, which are companies whose products are generally considered to be detrimental to one's health or well-being. They typically come from industries such as tobacco, alcohol, gaming, and others. For investors who don't mind the social stigma associated with these business models, there are above-average dividend yields to be had. Two such sin stocks are Big Tobacco majors Philip Morris International (NYSE: PM) and British American Tobacco plc (NYSEMKT: BTI). Philip Morris International operates the Marlboro brand in the overseas markets after being spun off from former parent company Altria Group in 2009. Philip Morris recently dipped below $80 per share, pushing its $4 annualized dividend to a 5% yield. Fundamentally, Philip Morris' payout appears secure. The company generated $6.5 billion in free cash flow last year while paying out $6 billion in dividends, and it forecasts 2015 free cash flow to be close to last year's. British American Tobacco often gets lost in the Big Tobacco discussion, but its dividend yield is the highest in the industry, at 5.8%. Sometimes, a yield this high would throw up red flags about the dividend's sustainability. But tobacco companies often sport higher yields, and British American Tobacco has enough cash flow to keep supporting its hefty payout. The company generated approximately $3.5 billion in free cash flow last year, and it paid about $3.1 billion in dividends in the same period. Lastly, there's Las Vegas Sands (NYSE:LVS), which recently yielded 5%. Its very high yield is the result of two major factors, the combination of a falling stock price and rapid dividend growth. Las Vegas Sands has suffered a 29% decline in stock price over the past year. Fundamentally, Las Vegas Sands' stock price is falling because investors are concerned about the growth prospects at Asian gaming mecca Macao, where gambling activity has slowed. This hit Las Vegas Sands hard; its casino revenue at its Venetian Macao operations fell 27% in 2014, year over year. Additionally, hotel occupancy fell 6 percentage points last year, to 88%. However, it doesn't seem management is overly concerned, because the company has been aggressively raising its dividend during these challenging times. Since Las Vegas Sands started paying dividends in 2012, it has upped its dividend by a whopping 37% per year over those three years. Even with these aggressive bumps the dividend is still safely covered by cash flow -- the company raked in $3.5 billion of free cash flow last year and paid $2.3 billion in dividends. Some investors may object to buying sin stocks, but for those who don't mind the businesses, there are big dividends to be had. Philip Morris International, British American Tobacco, and Las Vegas Sands are all highly profitable companies, and each offers rare 5% dividend yields. Most importantly, those high dividends are backed by more than enough free cash flow.